How does solar power work? Is it right for your home? The sun produces a staggering amount of energy – (1) 4 million tonnes (of joules) per second. A single hour of the sun's energy could power the world for a year. Worldwide, we're currently only using about 1/10,000th of that total potential for our (1) energy consumption. Given that the sun is such a powerful, renewable energy source, harnessing its incredible power makes sense. 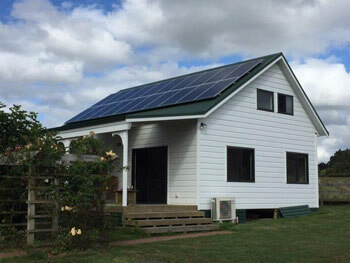 But how affordable are solar panels in New Zealand? How much money could you actually save on your energy bill and are they the right energy solution for your everyday life? You can find out more about our solar energy offers here. Solar power, or solar panel systems commonly refer to photovoltaic (PV) solar panels that generate power for your general household use. Each solar photovoltaic (PV) panel is made up of a number of connected solar cells. When the sun is shining, the solar panels absorb the light, and the silicon and conductors in the panel convert this light into DC (Direct Current) electricity. This flows into an inverter, which converts the DC electricity into AC (alternating current) electricity – which is then available for use in your home. Solar panel systems are generally installed as ‘grid-connected'. This means that if your solar panels are producing more electricity than your home is using at the time the excess power gets sent back to the grid. And if you need additional power, then your home will still draw electricity from the grid. Can I store solar power to use later? If you just install a solar PV system, then the power generated by the solar panels needs to be used immediately. It can't be stored. However, there are a range of battery storage options now available that allow you to store excess solar energy for later use. Battery storage costs are still relatively high making it uneconomical for most households, but it is an emerging market that is developing rapidly. Genesis is currently working with a number of manufacturers and distributors in New Zealand to ensure that any battery storage products we might offer will be well suited to the New Zealand market. Genesis is keen to hear from anyone who is considering adding storage to their existing solar. Register your interest here and if in the future we identify storage and other solar related products we'll be in touch. Most of New Zealand is suited to PV solar panels with good sunshine hours annually. (2) They are particularly good for our most sunny regions, such as Northland, Auckland, Nelson, Bay of Plenty and Marlborough. Solar panels convert the light from the sun's rays into electricity, so you don't need to live somewhere warm for them to work. You will also need a suitable roof for solar to be installed on. Solar works best on a north facing roof and may be suitable for roofs with an east or west orientation. Your roof also needs to be in good condition and largely free from shading. While solar power has long been a favourite of environmentalists and those seeking a self-sustainable lifestyle, solar panels have also traditionally been expensive and outside the budgets of the average New Zealander. However, this is changing with a dramatic decrease in prices over the last ten years. With this price drop, solar panels are becoming a more feasible option for households and businesses that can use a reasonable amount of their solar generation during the daytime. Genesis currently offers a range of fully installed solar panel systems, starting from $5,740 (incl GST) for a 1.5kW system (or $5,240 (incl GST) for Genesis Energy customers). You can see our range of options here. You will also need to install a new meter which will be capable of measuring grid electricity imported and exported at your home. This will be arranged through your electricity retailer. Genesis currently charges around $100 for this, but the charge can differ by region. You should check with your electricity retailer to see what this charge would be for your home. Will solar panels lower my energy bill? Solar panels can provide energy savings for people who can use a large portion of their solar generation. They can be a great option if you are at home throughout the day, or if you have items such as pool pumps or air-conditioning that use a lot of energy during the day. As you are using your solar generation first, you only have to draw electricity from the grid when you need it. So your electricity bill will be reduced. Each individual customer's savings will vary and will depend on a number of factors, including how much power their system generates, how much they are paying for electricity and how much of their solar generation they can use. Genesis recommends that each customer looks into what solar can do for them, and may even be able to assist with recommending the best system size for your household. Feed in tariffs ("FiT")– also referred to as ‘export tariffs' or ‘buy-back rates' - are what customers are paid by their electricity retailer for any excess electricity fed back into the grid. Of course, the key benefit of installing a solar panel system is that you can use your solar power which means you don't draw as much from the grid. In addition, any unused solar power currently gets put back onto the grid, which may mean you can sell this back to your energy retailer. Genesis HomeGen plan, pays customers a rate per kilowatt hour for exported electricity. Genesis will credit your exported electricity at 8 cents per kilowatt hour excluding GST. (GST registered customers will be paid 8 cents per kWh plus GST for their exported electricity). HomeGen credits will appear on your Genesis monthly bill. The HomeGen 8 cent per kWh rate is available anytime, nationwide. Terms and conditions apply to our HomeGen programme. Most (but not all) retailers offer a FiT, and you should check with your individual electricity retailer. Customers should also consider the overall value of their energy plan (and not just the FiT component) when choosing their electricity retailer. Use this chart to see what Genesis solar package could be right for your home. At this time Genesis only installs in the Auckland, Whangarei and Hamilton areas. Find information on Genesis solar packages here. Or contact us for more information. What's the future for solar? As prices for solar panels in New Zealand become more competitive and battery storage technology advances, solar energy is likely to get more common in New Zealand. While going completely off-grid is expensive, and mostly undesirable - except in rare cases where it's prohibitively expensive to connect to mains power - solar panels are still a great way to stay in charge of your own energy usage, produce your own green, renewable energy and become more self-sustainable. As the cost to install solar improves, it seems set to be a firm part of the renewable energy plan for our future.